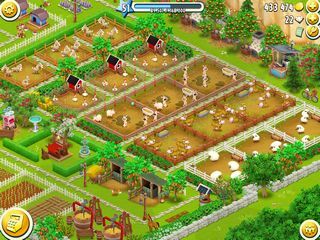 Hay Day is a game for everyone, but it seems that it will be especially attractive for those who enjoy the abandence and the smells of farmer's markets, but aren't actually involved into all the labor that goes into it. It is also a kind of place where you are part of it but in reality you only enjoy the beautiful scene and you literally only lift and move your finder to get the work done. 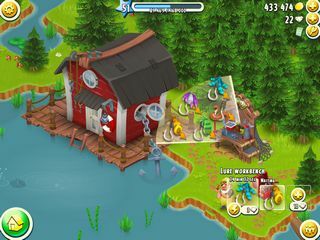 The game play is similar to that of many sim games available for other platforms. Right now, as the spring is coming to the end and we get to enjoy fresh vegitables and fruit, it is really apropriate to start a farm of your own on your device simply by downloading Hay Day. You have animals to take care of like cows and sheep and crops to gorw and harvest. Once you've done that you can start doing some other tasks that never end on a farm. The visual part of this game is one of the addictive things - the colors are so bright and the images are full of life as plants grow and the animals multiply. The game play is similar to that of many sim games available for other platforms. The fact that you need to use your finder and the touch screen does not make it frastrating or hard. It does take a while to get the produce from cows and chickens or harvest, but you can spead up that with the help of diamonds. There are achievements for every part of your farm, so it can get very addicting to get those done. The game is really beautiful and fun and adds happines to your daily life.